Whether large or small, modern or old-fashioned, cluttered or organized, the kitchen represents the heart of the home for many of us. It's the place where we gather with others to eat, cook, and share parts of our day. 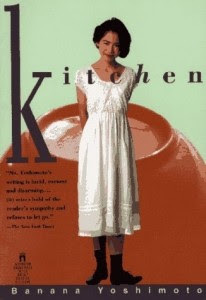 Kitchen is also a novel by Japanese author Banana Yoshimoto, a critically acclaimed example of contemporary Japanese literature, published in 1988, and translated into English in 1993 by Megan Backus. Kitchens in Japan are called Daidokoro (台所; lit. "kitchen", notice the little house symbol). Until the Meiji era, a kitchen was also called kamado (かまど; lit. "stove"), which was considered to be the symbol of a house; the term could even be used to mean "family" or "household", similar to the English word "hearth". In this novel, a young Japanese woman, Mikage Sakurai, has just lost her grandmother, her last living relative, with whom she has lived for several years. Grief-stricken and on her own, Mikage is invited to the home of one of her grandmother's friends, a young man, Yuichi Tanabe, and ends up staying with him and his transsexual mother, Eriko. After Mikage's arrival at their apartment she inspects the kitchen and starts to feel at home. Mikage has always been enchanted by kitchens, which seem to nurture and comfort her. She quickly falls in love with the kitchen at the Tanabe's home. "Lit by a small fluorescent lamp, all kinds of plates silently awaited their turns, glasses sparkled. It was clear that in spite of the disorder everything was of the finest quality, There were things with special uses, like . . . porcelain bowls, gratin dishes, gigantic platters, two beer steins. Somehow it was all very satisfying. I even opened the refrigerator (Yuichi said it was okay)--everything was neatly organized, nothing just 'left'. I looked around, nodding and murmuring approvingly, 'Mmm, mmm.' It was a good kitchen. I fell in love with it at first sight." Mikage feels lost and lonely after the death of her grandmother. However, with the help of Yuichi and his mother, and through her cooking and job as a culinary teacher's assistant, she begins the healing process. There's also a budding romance in this book, which is a lovely treat. This novel centers around food and its preparation. I must admit that while reading this book, I started to crave Japanese food (I adore miso soup and bento boxes), especially the katsudon--even though I rarely eat pork--because it sounds so delicious in the book. 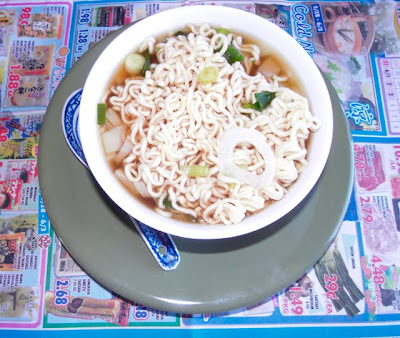 Influenced by my reading but unable to head to my neighborhood Japanese restaurant, I went to the kitchen and made some ramen noodles with onion and scallion for lunch. I've read some criticism of this short novel, and this book is certainly not for everyone. As for me, I'm interested in modern Japanese culture, food, and fiction, and was intrigued by this book. Yoshimoto uses words sparingly, yet deals with large themes such as death, isolation and loneliness, love, and food. She captures the essence of what she writes about with a clear and simple elegance. At first I was startled by the descriptions of Eriko's radiant physical beauty (she used to be a man, Yuichi's father), but soon I appreciated the unconventional aspect of this. These unlikely housemates form a new family, a new home, their own "kitchen". I really enjoyed this short book. My edition of Kitchen also includes a novella, Moonlight Shadow, a much shorter story about love and loss and healing, with a touch of the supernatural, which is also quite engaging. Special thanks to Dolce Bellezza's Japanese Literature Challenge 3 and Rebecca Reid's Spice of Life Reading Challenge, which motivate me to read books that I probably would neglect otherwise! I'm glad you liked this book much more than I did. And I agree with Amanda, your effort to show us all the Japanese characters is awesome! Amanda and Mee, it was very easy to get the Japanese characters--I simply copied them! I think this book sounds pretty amazing; thanks for posting about it. I liked this book, too, although I have yet to read anything else by Yoshimoto. I love it when a book I read makes me hungry! It means it was written well. I'm glad you enjoyed this novel!! I like that theres a budding romance in there too. When a book centers around food, it gives me cravings too....lol. I love books that revolve around food, and also books about Japanese culture, so this is a great find for me. Thanks for your review - I just checked my library and they have a copy! I've put in a request for it. Feeling very happy about that! Diane, thanks for stopping by and enjoy your weekend. Rebecca, thanks so much for stopping by and for hosting Spice of Life: A Reading Challenge. It has been so much fun, and I may need to "upgrade" my level of participation. Nadia, thanks for your upbeat comment. I always enjoy hearing from you. Belle, I hope you enjoy the book. Let me know if you post about it. More comments welcomed as always. I enjoy noodles soups too, so I think I must read Kitchen. I also enjoyed your review. I'd heard of this book, but never read it. Your review has placed it on my list (I like miso soup, too). Thank you for getting to the heart of the "kitchen." I've just read another book by Banana Yoshimoto, but I found that I didn't quite like her style all that much. From what you've written here, looks like most of her work is quite similar, in the sense that she uses simple phrases and vocabulary. Book Bird Dog, thank you! ds, thanks for your perceptive comment. Michelle, I'll be interested to know what you think of Kitchen if you do read it. Thanks to each of you for taking the time to comment. Additional comments welcomed. This sounds exactly like my kind of book, and I'm going to have to look for it to see if I can find it around here. Thanks for the lovely review, and for drawing it to my attention! Really interesting review. I personally love to read and watch anything about cooking and food so I will have to try this one out! kiirstin, I hope you'll enjoy Kitchen. Meg, thank you for stopping by and for the award! Awesome review! I have heard so much about this book, yet had never come across a review of it. It sounds like something I might really like, and the characters sound very unique. I am going to try and grab this one from the library and give it a chance. Thanks! I need to figure out where to go to eat Jap food.. you got me wanting to do that! Zibilee, if you read Kitchen I'll want to read your review or know what you think of it. Thanks for taking a few moments to read this post and add a comment.